Instant Provider Card. Nationally Accepted. 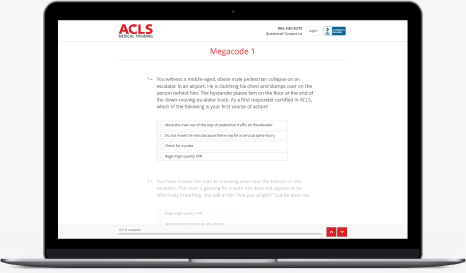 Thousands of medical professionals in over 80 countries rely on ACLS Medical Training for ACLS, PALS, and BLS continuing education and certification. Immediately after passing the exam you will be emailed your provider card which you can print and use as proof of your certification while waiting for your hard copy provider card to arrive in the mail. We mail cards out daily which typically arrive within 3-5 business days. 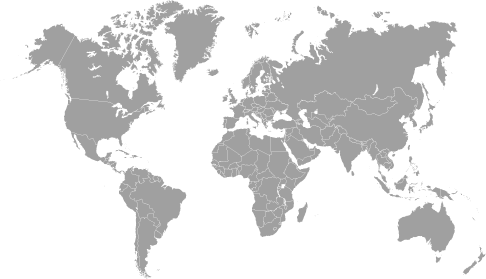 Our provider cards have been accepted in every US state and Canadian province, along with dozens of other countries stretching across Europe, Africa, and Australia. 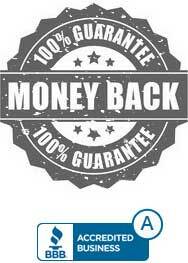 We guarantee your employer will accept our provider card with our 100% money back guarantee. Our course and exam is 100% online based and can be completed in its' entirety on any computer, tablet, or smartphone. Our certification includes online megacodes in lieu of an in-person skills test. We also provide skills test checklists so you can review with a co-worker or local skills instructor if desired (or required by your employer). At ACLS Medical Training our vision is to improve outcomes by empowering individual paramedics, nurses, physician assistants, nurse practitioners and physicians. Our goal is to teach medical professionals in an innovative learning experience that helps to enhance the systems of care that save lives! We offer resources for ACLS, BLS, and PALS continuing education and certification. We provide comprehensive online education and ACLS recertification for students and seasoned medical professionals alike. 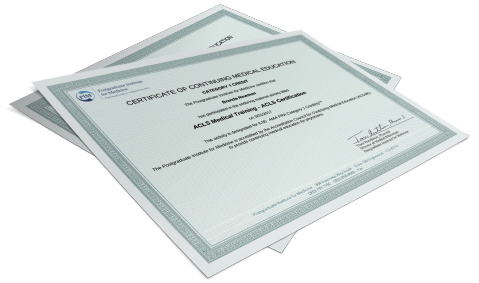 If this is your first time certifying, ACLS Medical Training has over 20 hours of content in our comprehensive ACLS course, including our provider manual, practice tests, megacode simulators, algorithms, and more. 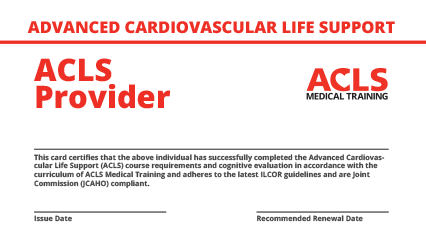 If you are simply looking to renew your current ACLS certification, ACLS Medical Training provides a targeted refresher covering the latest information from the American Heart Association guidelines. 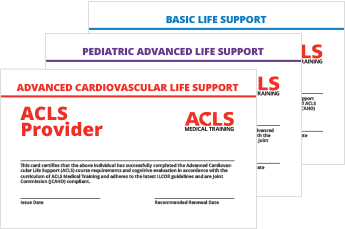 ACLS Medical Training has compiled information from the American Heart Association guidelines and primary medical literature to create an innovative learning experience. All course materials were written and reviewed by our team of U.S. nurses, paramedics, and physicians, ensuring the highest possible quality and scientific accuracy. If you want to see the quality of our content, simply review our complimentary provider manuals before you register for our full course. We understand your time is valuable. You want top notch, relevant continuing education that enables you to provide the highest quality care you can deliver. Most importantly, you want this education to conform to your schedule! That’s where we come in. By “flipping the digital classroom” we allow you to certify on your schedule. Simply schedule enough time to learn the material and pass the examination. You are in control of your learning. We stand behind our course with a 100% accepted or your money back guarantee. If your employer will not accept the provider card, you will be issued a prompt and courteous refund of your entire course fee. Our provider cards have been accepted in all 50 U.S. states and in over 80 countries. When you are ready to learn, ACLS Medical Training is ready to help. Every single one of us at ACLS Medical Training is a lifelong learner. 1Sign Up for your certification or recertification course from our homepage. 2Study the provider manual and take practice exams before taking the final exam. 3Take the Exam when you are ready and receive your score instantly. 4Retake the Exam (if necessary) as many times as needed at no additional cost. 5Receive Your Card instantly to your email address and via standard mail. making your training and certification process a breeze.